Based in Quincy, Illinois, Williams Shooters Supply, Inc. was founded in 1971 in the basement of the Williams family home. The company soon turned into a retail store, then evolved as a wholesale distributor of shooting sports including firearms, ammunition and accessories. Today, Williams Shooters employs 40 team members, distributes to retail stores in all 50 states, and continues to be family-owned for two generations and counting. Throughout its growth, Williams Shooters Supply Inc.’s mission has been to provide its customers with top quality products and service. Pricing in our industry is volatile. Entering pricing changes and new products is a time consuming process for us, and it’s not sustainable to have to enter these changes in twice--in our ERP and eCommerce site. Over the last four years, Williams Shooters Supply, Inc. has experienced tremendous growth. And in order to support this growth and continue to provide its customers with top quality service, the company needed an updated eCommerce solution. Williams Shooters had been maintaining a homegrown website, but found that it had become outdated, difficult to maintain and update, and could not sufficiently support demand for products. When Leanne Williams, Corporate Secretary, joined the family business, she knew it was time to seek a new eCommerce website. New to the shooting sports industry, Leanne had a difficult time navigating the company’s existing website. “Even if you don’t know a product well, you should still be able to use the website,” says Leanne. With that goal in mind, Williams Shooters sought an eCommerce solution that would allow the company to add, update and organize products in a way that allowed anyone to navigate the site, whether a novice or expert. Web orders are easier to process because we no longer have to re-key information into the ERP system. Through a strong relationship with partner organization Integrated Business Solutions, the team at Sniperdyne was able to gain a thorough understanding of Williams Shooters' erpCommerce needs, and the company chose the Nomad erpCommerce solution. Built to integrate directly with the company’s Exact Macola ERP, Nomad allows Williams Shooters to sync the data within its ERP with its eCommerce website, alleviating many of the issues faced with its old eCommerce solution. Williams Shooters has been able increase its product lines and SKUs--now with over 23,000 products on its site--and can display product information in an intuitive format, allowing for ease of navigation. And with Nomad erpCommerce, pricing changes need only to be performed in the company’s ERP, as changes are automatically reflected in the eCommerce site. Because of the ease of adding and changing product information, website administration is shared by members of the Williams Shooters marketing team--though none of the team members have formal web design experience--and is performed as just a part of their primary job responsibilities. And while Williams Shooters allows its customers to order via phone, fax, mail or online, the company has seen an increase in website orders, resulting in less administration for its staff. “Web orders are easier to process because we no longer have to re-key information into the ERP system,” says Leanne. The synchronization between ERP and eCommerce and detailed reporting capabilities has also provided the added benefit of aiding the sales department in more quickly and accurately tracking commission on product sales. Finally, as industry compliance requires that customers provide credentials before they are granted access to the site, Nomad allows Williams Shooters to only permit approved users to access its full site. We value the personal contact that we have with the Sniperdyne team. We know that our company is more than just a number with Sniperdyne. Able to support the company’s growth and scale to accommodate the ebbs and flows of seasonal sales, The Nomad erpCommerce solution and the team at Sniperdyne has allowed Williams Shooters to experience significant improvements over its previous eCommerce solution. Now, Williams Shooters looks to use the rich analytics provided by Nomad in order to become more aware of order trends, seasonality, and discover more information about their business and the behavior of their customers. “We value the personal contact that we have with the Sniperdyne team. We know that our company is more than just a number with Sniperdyne,” says Leanne. Nomad erpCommerce is a robust, easy-to-maintain, easy-to-design and easy-to-scale eCommerce solution that integrates with any ERP system. Our team has designed and delivered superior eCommerce solutions integrated with ERP for 10 years with the goal of helping small to mid-sized manufacturers and distributors achieve efficiency and growth through technology. Want to learn how Nomad erpCommerce can help your organization achieve its growth goals? Call us at 855.225.6304 or click on the button below to request a demo. Seamless integration with ERP: Nomad is able to seamlessly “talk” to Williams Shooters Exact Macola ERP, allowing the company to feature over 23,000 products with less administration time. Optimized for complex pricing situations: Nomad allows a company of Williams Shooters’ size and scope to change pricing of many products and add products with frequency and with seasonality. 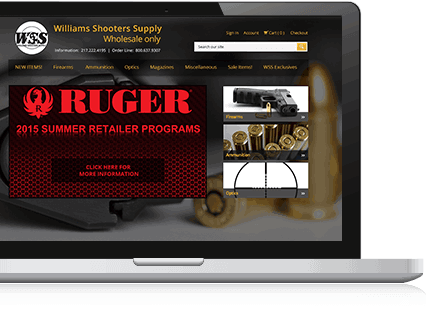 User friendly design and marketing options: Williams Shooters is able to add, update, and change product info, images and look of the website with ease and can grant access to only approved customers. Improved customer experience: Williams Shooters customers can view order information, inventory information and order tracking without having to call customer service. Improved sales experience: Due to synchronization of data with the company’s ERP and rich reporting, tracking sales commissions through the Nomad site is quicker and easier.